Thank you for your interest in Spirometer Pod. Please complete and submit the form below and an ADInstruments representative will aim to get in touch within one working day. If you’d like to speak to someone immediately, office contact information is available from the contact page. The Spirometer Pod is ideal for teaching, which provides entry level human respiratory flow measurements using an appropriate respiratory flow head and PowerLab data acquisition system. 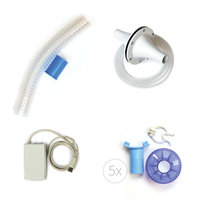 Respiratory Flow Heads 1L and 10L for designed animals are also available if required. The Spirometer Pod only functions with a PowerLab data acquisition system and therefore are not suitable for use with other data acquisition systems. A research grade Spirometer is also available when increased accuracy, resolution, precision, gain, filtering options and stability are required. When used with ADInstruments respiratory flow heads and the Spirometry LabChart Extension software, compensated volume and forced respiratory parameters can also be determined.